Being an artist and a musician is much more than a hobby or a passion, it's a calling that lies inside every little kid that ever picked up a guitar, a camera, or pen and felt the need to create. 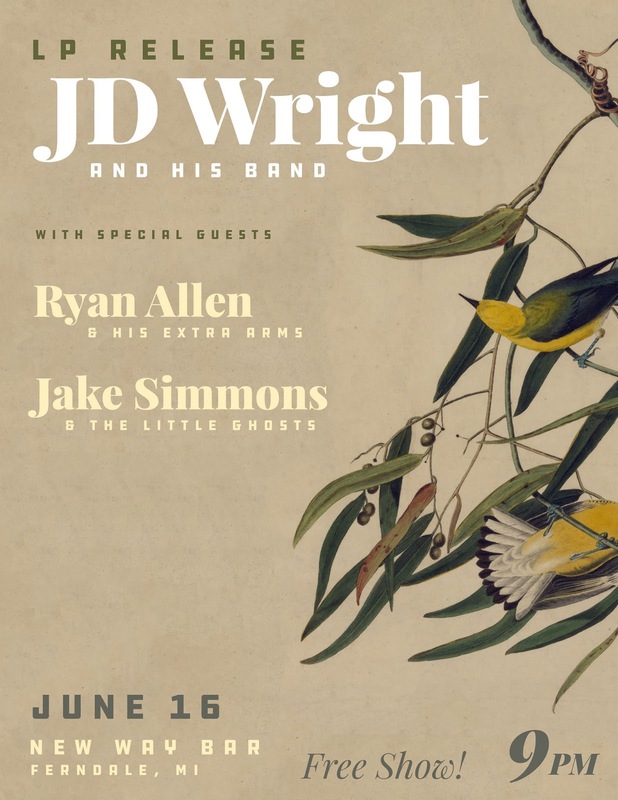 JD Wright has been following his musical calling for the last 15 years and during the time has has created some really special music with bands like Reuther, Cheapshow, and Due North, but this summer he's taking a new journey and releasing new music himself. "Teeth" a listen, check out what JD had to say about his latest project. HID- Why did you decide to record a solo album? JD- "I think I've known for a long time that this is something I wanted to do -- there were even a few times when I started working on a project and got discouraged and abandoned it. I've been playing in bands for over 15 years, and I think it's only been in the last few years that I've gained the ability, and the confidence in my own abilities, to make something like this happen." HID- Where was this recorded and mastered? JD- "The album was recorded at Drifting Sun Studios in Ferndale, Michigan by my good friend Charles Huber. Chuck and I mixed the thing, and it was sent to Bill Henderson at Azimuth Mastering." HID- What was the most challenging part of writing and recording your first album on your own? What was the most rewarding part? JD- "Melody has always come easy to me -- lyrics are always something that I've struggled with. What I've learned over the course of this endeavor is that writing good songs takes a lot of time and elbow grease. When I was younger, I would often scribble down the first thing that "fit" in the line or verse or part I was writing -- there was very little revision. Now I take a lot more time to write, and rewrite, and write, and rewrite, until I get it, well, right. The most rewarding part of this whole process has been finally wrapping it up and having 6 huge boxes of vinyl records show up at the door. I started working on these songs in September of 2016, so this has been a very long process for me and I'm really happy to finally have a finished product." HID- The lyrics for this album seem deeply personal at times, are the songs written from personal experiences? JD- "These songs are fiction. That's another thing that is new for me this time around. I used to write songs about my life, but I'm getting close to 30, I go to work 40 hours a week, and come home to happy household so it's just not as easy to write lyrics that are literally about my life anymore. The idea of writing a concept album was sort of a exercise in creativity that I found I really enjoyed. That being said, most of these songs were inspired by people I've known, places I've been, or things I've seen or heard. (Any resemblance to actual persons, living or dead, or actual events is purely coincidental.)" HID- Who did the backup singing on some of the tracks? Is it you? JD- "That's me. My dudes Noah Fenton and Eric Plunkard will be helping me out during the live shows." HID- Do you have any formal vocal training? JD- "Zero, but I'll take that as a compliment. Actually, that's not quite true. When I was like 19 or 20 I took one vocal lesson from a little old lady in Bloomfield Hills or somewhere up there who kept telling me to stop yelling. We didn't have another lesson after that." HID- What is your favorite track on the album? JD- "My favorite track is "Teeth". I wrote that song first and pretty quickly realized there was more of story here than I could possibly tell in one song. Plus I absolutely adore electric guitar solos, and there's a ton of space on that track for shredding." HID- What song are you most excited to perform live at the album release party? JD- "From the album -- Chickenshit. But we'll also be playing a couple new songs that I'm super excited to share with everyone." HID- This album is a real change from your previous projects (Cheapshow, Due North, Reuther). Why did you decide to take your music in this direction? JD- "Jokingly, I've been telling people that I wanted to make music that my parents could listen to. In reality, my musical tastes have just shifted away from punk rock as I've gotten older (sorry). In all honesty, I don't see a huge difference between punk and folk or Americana besides the delivery -- the structure of the songs are usually pretty similar." HID- You have a song that talks about a controversial issues here in the states, The Line 5 pipeline. Can you share your thoughts about it with us? JD- "If you haven't heard, there are a pair of 65 year old oil pipelines running beneath the Straits of Mackinac that were only designed to last 50 years. They are managed by the same company, Enbridge, that spilled over a million gallons of toxic black crude into the Kalamazoo River, something the residents and wildlife living near the river are still dealing with today. Enbridge has pretty conclusively demonstrated that they can't be trusted to ensure that their pipelines are safe, and in my opinion, it's not a question of if, but when Line 5 leaks. We are talking about a pipeline that's nearly 300 feet below the surface of a lake that regularly freezes over in an area where the current oscillates between Lake Michigan and Lake Huron, making cleanup exponentially more complicated than a "regular" oil spill. A spill in the Straights would be catastrophic, and I can't stomach the idea that we might have to tell our children that we knew about this problem and refused to do anything about it. I would never tell you who to vote for in November, but I would say that your should make sure whoever you vote for makes shutting down Line 5 a top priority. The song is called "No Swimming", and it didn't make the album, but I'll be playing it at the show." JD- "You can order the album from the Save Your Generation Records website here. Tony at SYG has been a fantastic help and works with a ton of great bands you should definitely check out." JD will be playing live this Saturday alongside Ryan Allen & His Extra Arms and Jake Simmons & the Little Ghosts. Doors for the show are open at 9 p.m. and 21 and over are welcome to attend for free because all New Way shows are FREE all of the time now! Lake Effect is out now on most digital platforms. Give it a listen here.